The for many (not me, I hasten to add!) 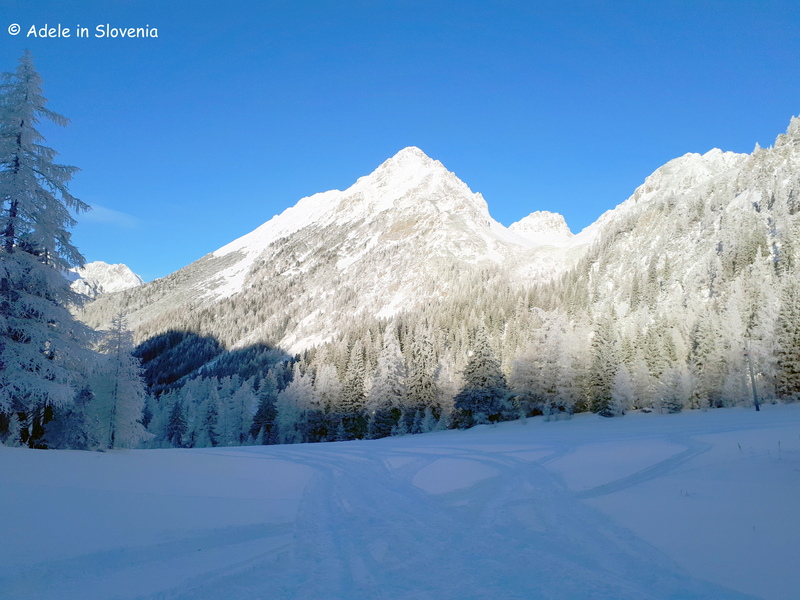 long-awaited first significant snow of the year arrived last Friday and, following a cloudy day on Saturday, Sunday’s sunshine and gorgeous blue skies saw almost half, if not more, of Slovenia heading out to pursue their beloved winter sports! 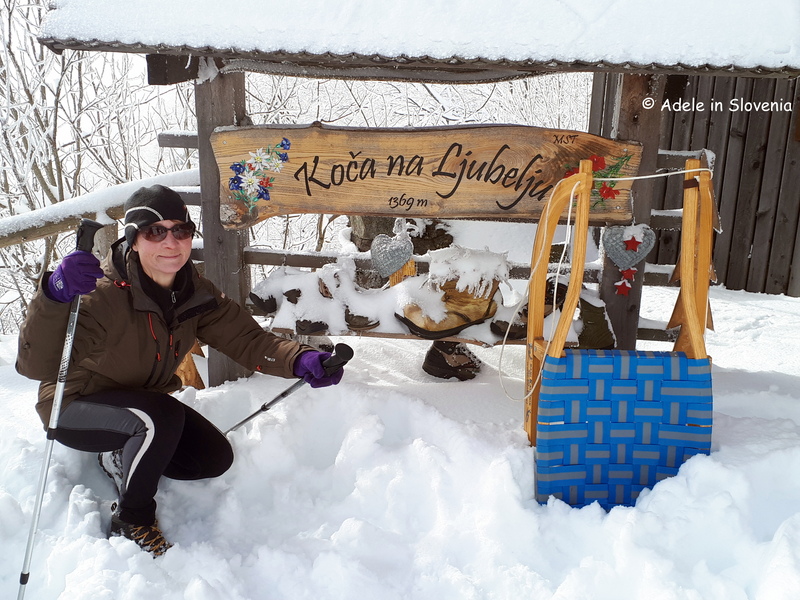 Among the most popular destinations in the Gorenjska region for sledging and other winter sports is Ljubelj, from where you there is a choice of going to either Zelenica or the old Ljubelj pass, or, like me, why not visit both in one day! 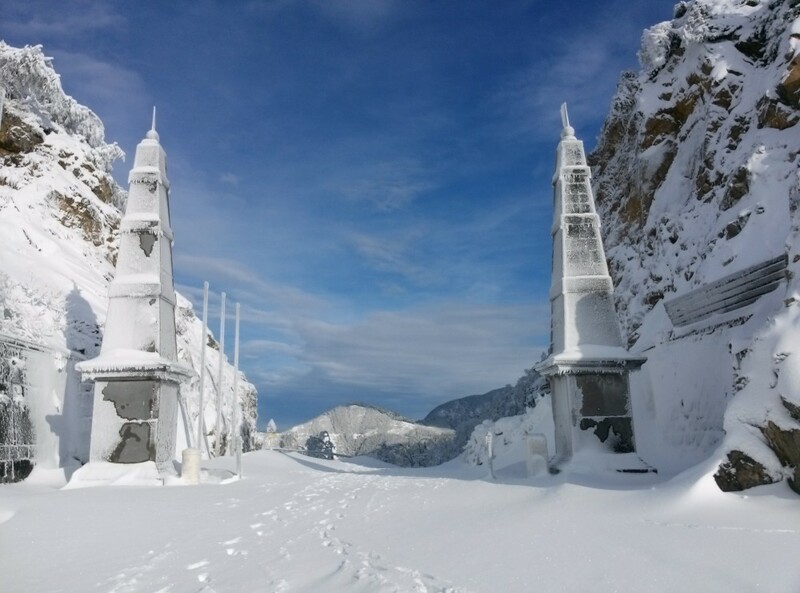 The Ljubelj pass is the oldest road pass in Europe. 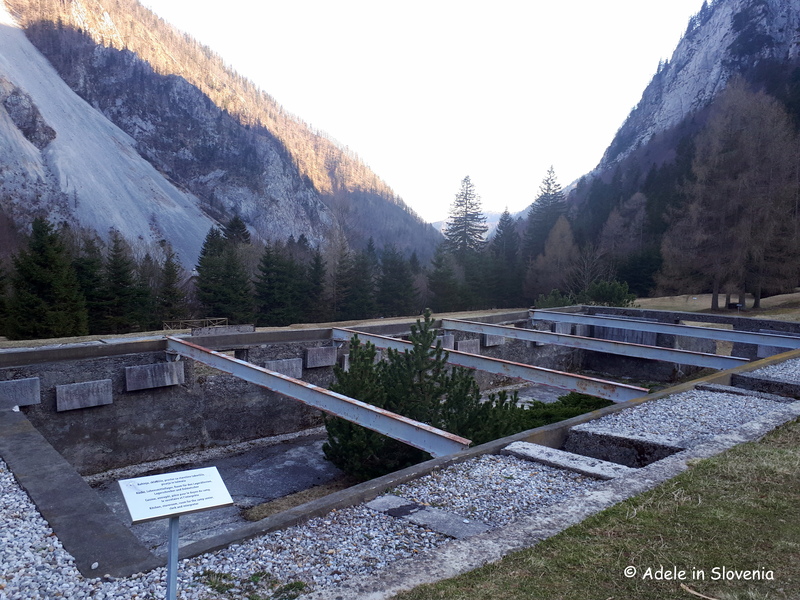 Prior to the building of the Ljubelj tunnel, the steep pass, which reaches 1,369 metres above sea-level, was the main transport route from Slovenia to Klagenfurt in Austria. 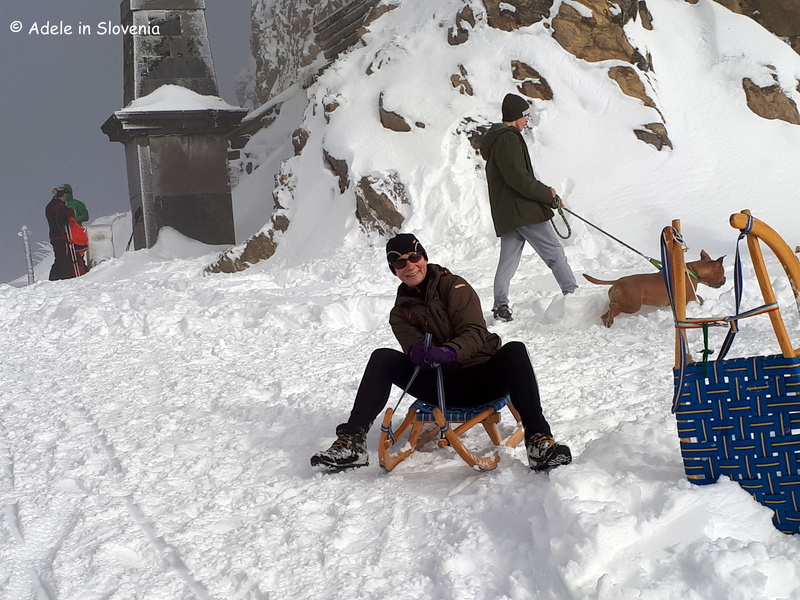 Since the building of the Karavanke tunnel in 1991, however, the Ljubelj tunnel is far less frequented, while the Ljubelj pass today is a favourite year-round destination for hikers and in winter it turns into a sledger’s paradise! 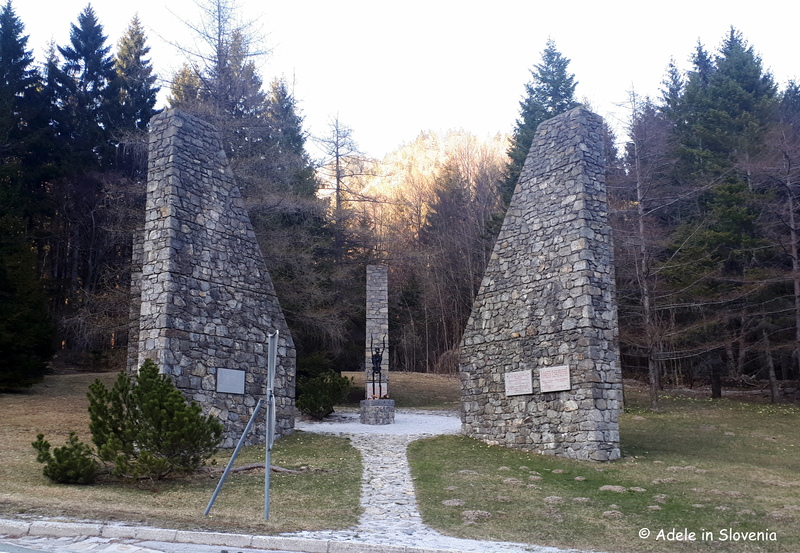 It takes about 45 minutes to walk up to the top where the border is marked by two stone obelisks. Having walked up in beautiful blue skies, a wave of fog suddenly swept in when I reached the top. Luckily, its pretty quick to get back down by sledge! 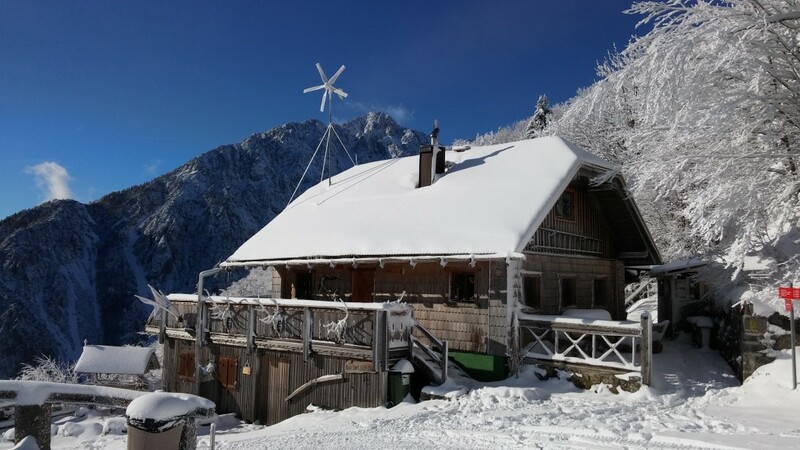 The Koča na Ljubelju mountain hut is located just metres from the border. 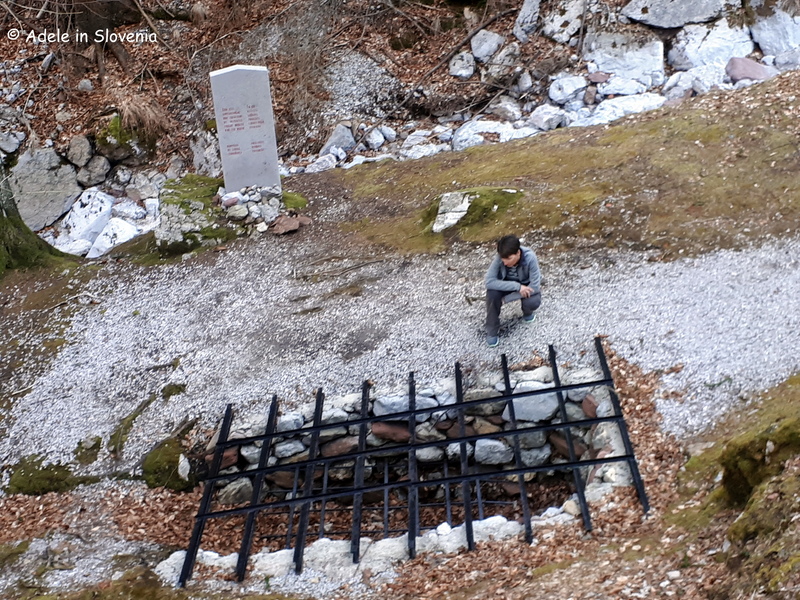 The Ljubelj pass road has long-since been closed to traffic other than for one day every year in September when the Hrast Memorial takes place. 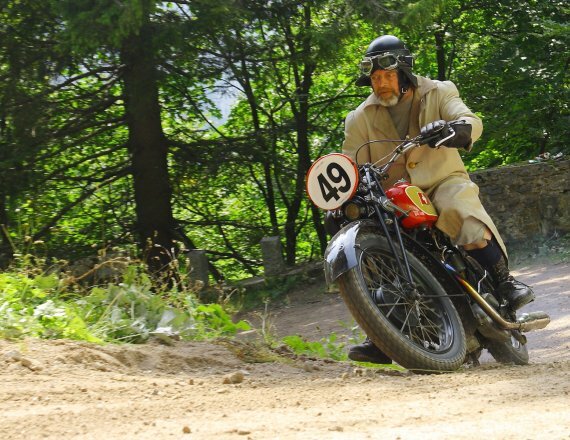 The event sees hundreds of motorbikes, motorbikes with sidecars, and old-timer cars competing up the 33% gradient. 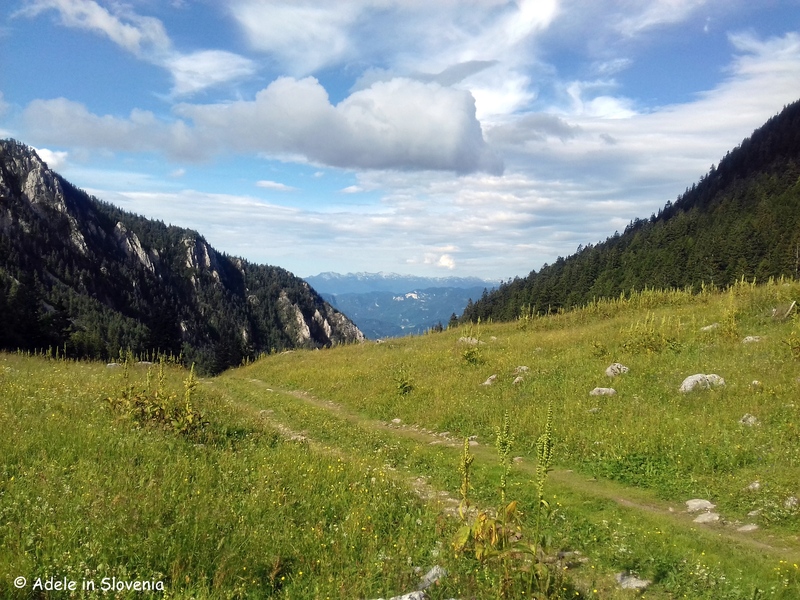 But Ljubelj isn’t just a winter destination, there are plenty of hiking trails to explore during summer too, on both the Slovenian and Austrian side. However, many of these routes are not suitable for hiking during winter, so be sure to check the conditions, plan carefully and have the correct equipment – which, it goes without saying, applies to all such winter sports. 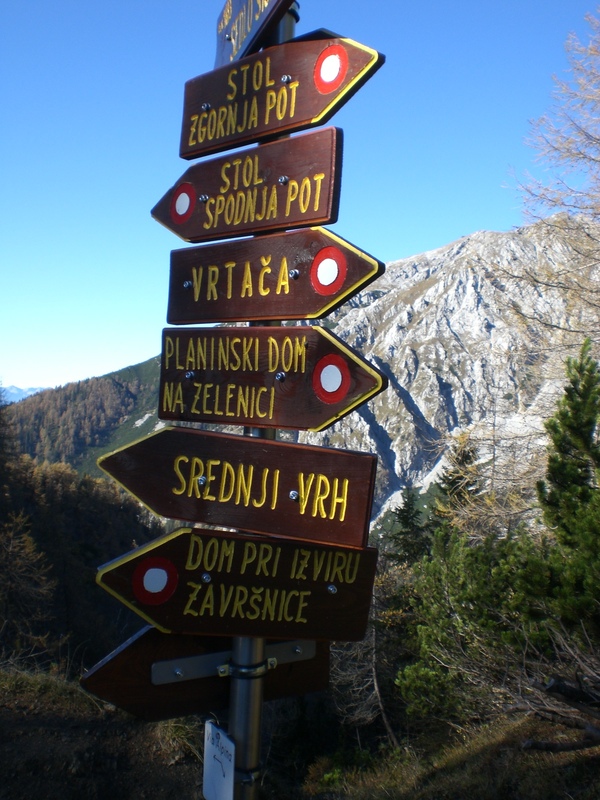 The Slovenian hiking routes are marked by red signs and the trails marked by red circles with a white inner, whereas the Austrian routes are marked by yellow signs and the trails along the border by green circles with a white inner. From the large car park just in front of the Ljubelj tunnel the trail to the Ljubelj pass goes to the right, whilst to the left is Zelenica. 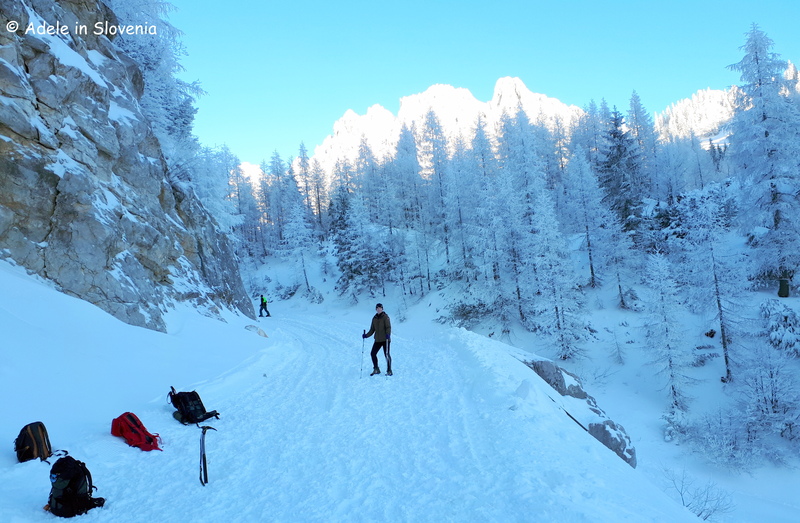 Despite no longer being an ‘active’ ski piste, Zelenica was very much ‘alive’ on Sunday with hikers, ski tourers, snowboarders, a mountain rescue team practicing winter mountaineering skills, sledgers, and I even saw one guy carrying a bike on his shoulder up the snow-covered ski piste! 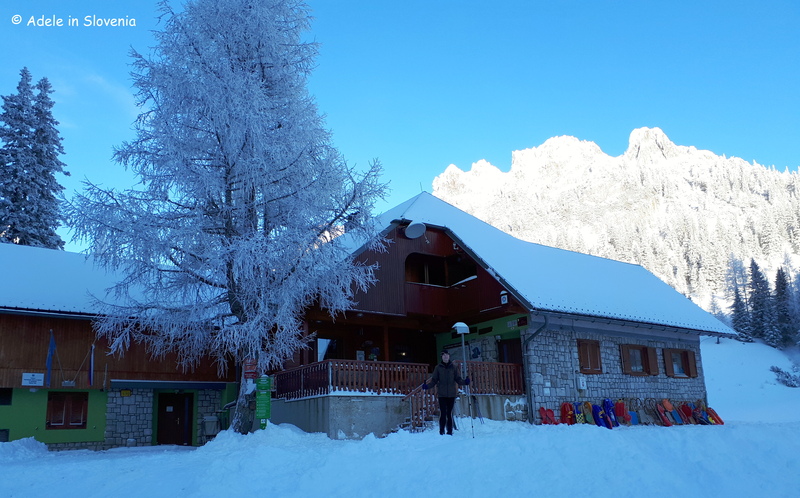 For many the target destination, year-round, is the Dom na Zelenici mountain hut (1,536m) whilst others continue onward to the surrounding peaks such as Triangel (1,704m), Begunščica (2,060m), Vrtača (2,181m) and Na Možeh (1,784m). 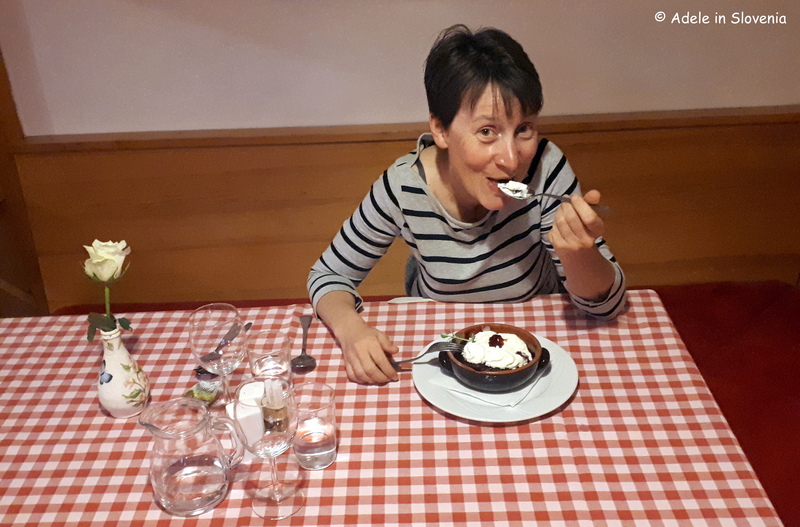 The hut is open daily in the summer (1.6 – 30.9) and during the rest of the year at weekends and public holidays (1.10-31.5). 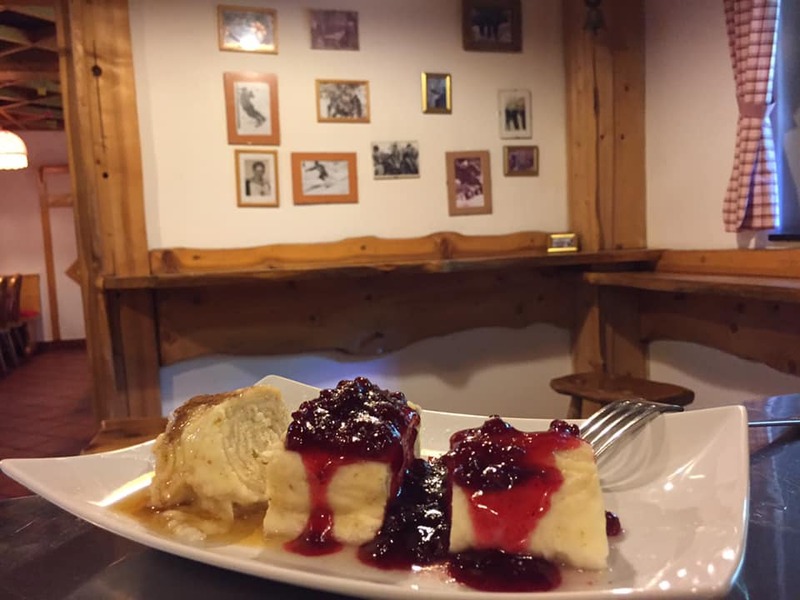 In addition to being a ‘regular’ mountain hut offering warm food and drinks for visitors, the hut is also a Mountaineering Education Centre and hosts numerous events, courses, lectures etc. It has 50 beds and can be hired for group events, training sessions etc. 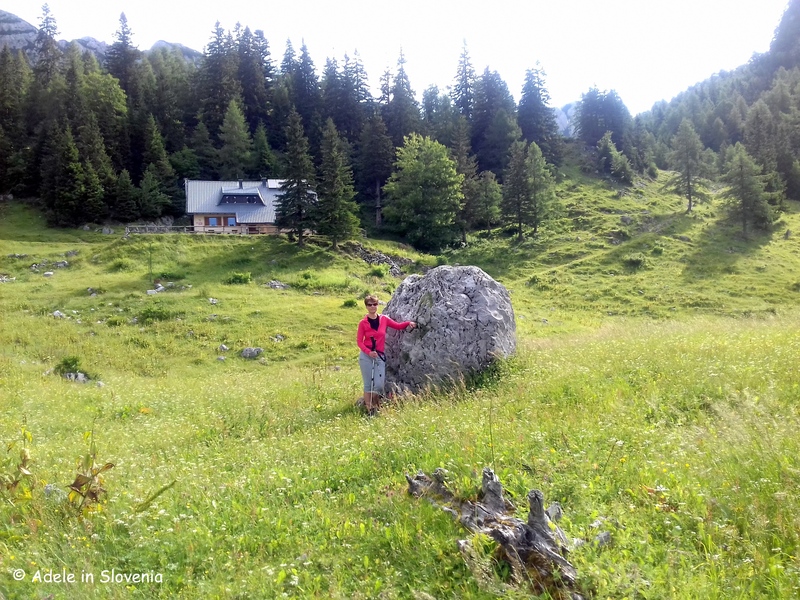 I will be writing plenty more about hiking in Tržič over the course of the year, and Ljubelj, when it isn’t snow-covered, is among the destinations I plan to visit as part of some longer tours to the surrounding mountains. 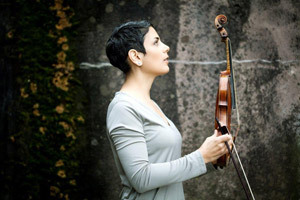 So, keep reading and, in the meantime, you can find more ideas and inspiration on the Visit Trzic website. Happy sledging (or skiing, hiking…)! 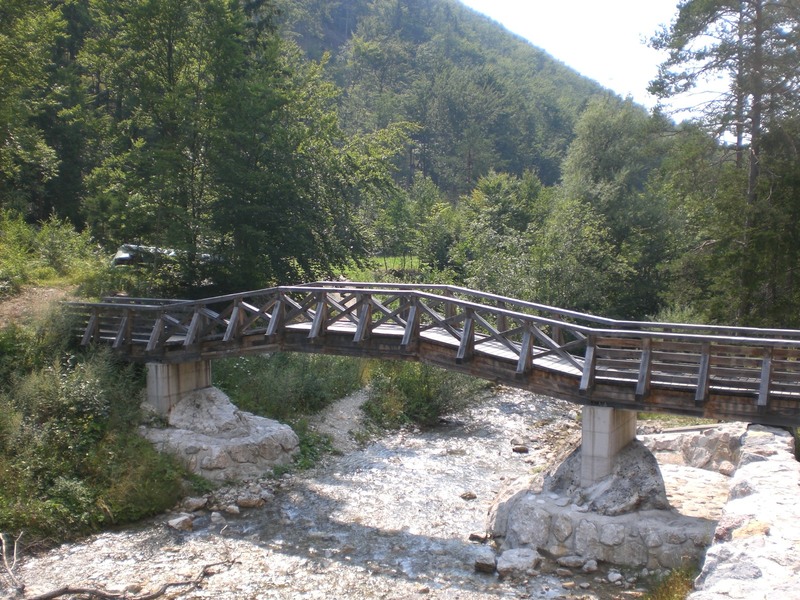 Srednji Vrh: Seeking the Sun and a Stream in the Karavanke! This ‘summer’ – not that it can really be called that thus far – hasn’t been kind to us outdoor types. This time last year we were basking in 35 degrees, whilst a week ago we had temperatures half that, and since the start of June there have only been a couple of days when there hasn’t been rain somewhere in Slovenia. Thus, trying to find days with clear blue skies for hiking and getting some good snaps for my blog have been few and far between. 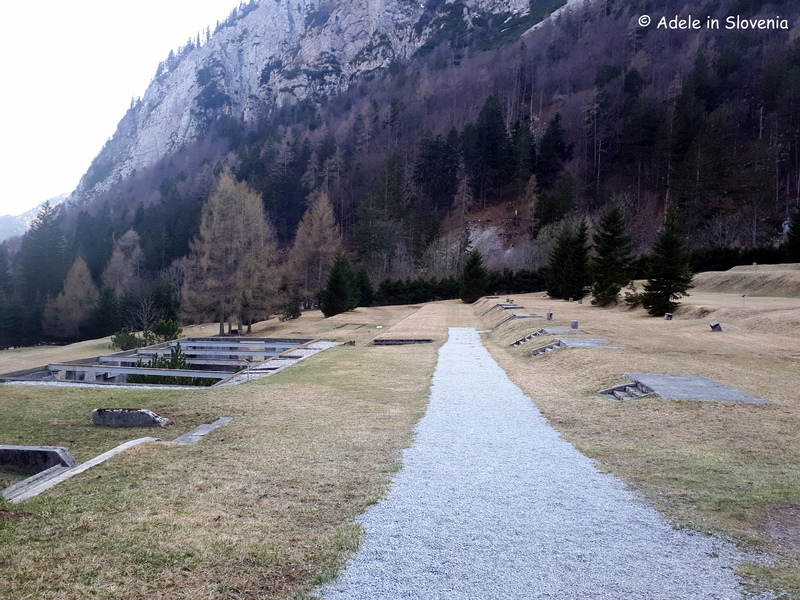 Fed up with waiting, I just went anyway, and, though not as gloriously sunny as I would have liked, I managed to get in a good hike in the Karavanke mountains to Srednji vrh and the Dom pri izviru Završnice (mountain hut at the source of the Završnica stream) – and even stayed dry too! 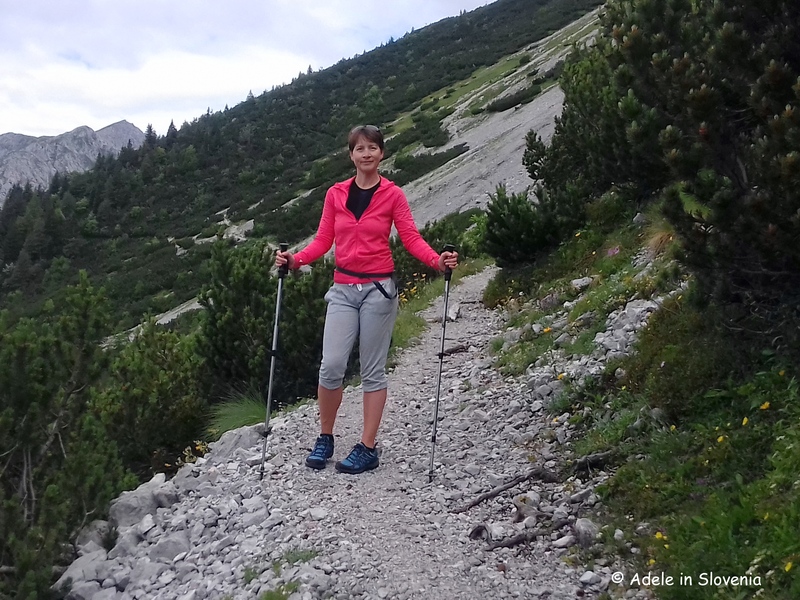 Despite the less sunny photos, I hope you, nonetheless, enjoy this glimpse into just one of the many fantastic hikes in the Karavanke mountains in the Žirovnica area. 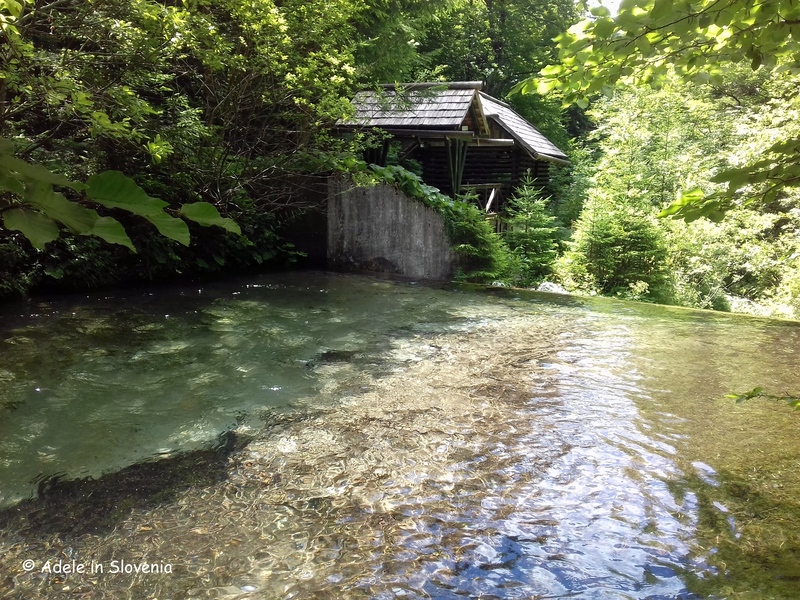 Join me on my trip to see the source of the Završnica stream and Srednji vrh! 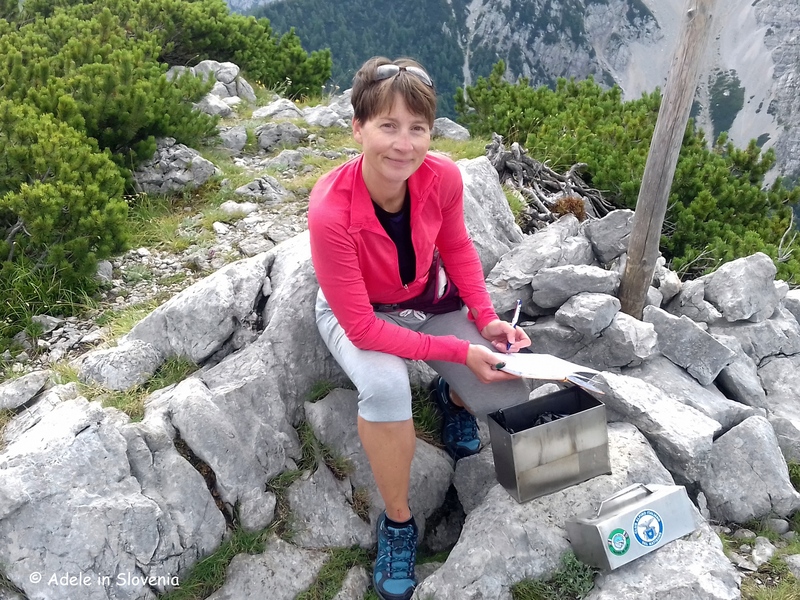 I started my hike from the Završnica valley. How far you go by car is a matter of choice – some choose to drive as far as possible along the valley, whilst I prefer to leave the car and set off on foot along the gravel road. You will want to stop and admire the reservoir (seen below on a sunnier day! ), but if you have transport, then do continue along the valley further before parking, as its a long walk from here. From here the road gets much rougher and it’s best to set off on foot. 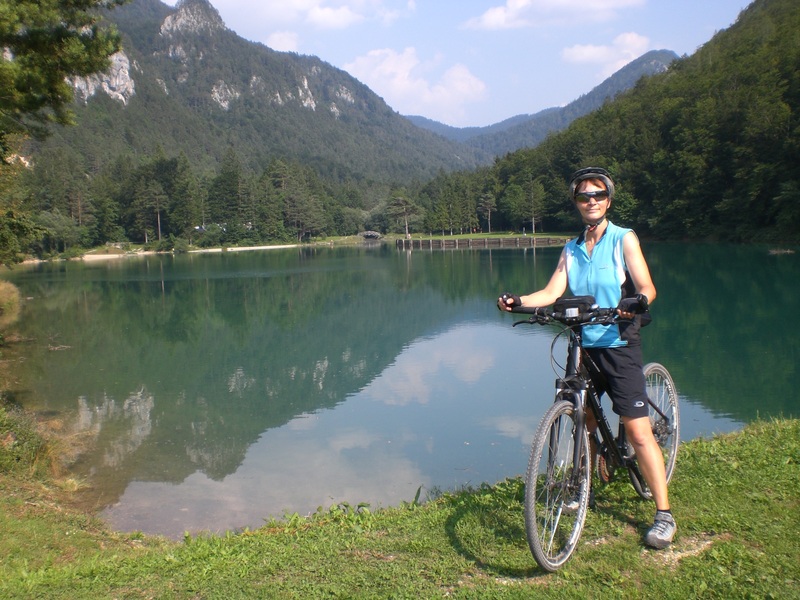 The area, with its many mountain pastures, is also popular for mountain biking. 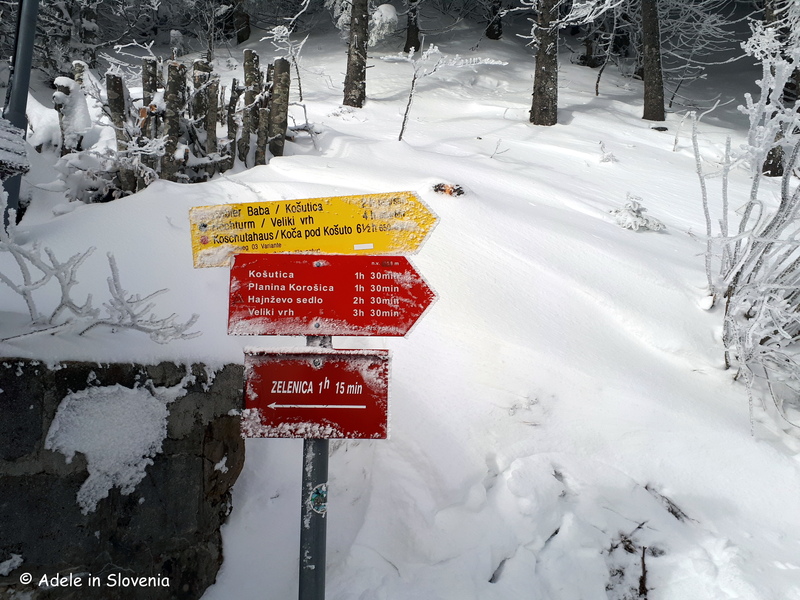 The road rises gradually to reach the Tinčkova koca hut, which isn’t actually an official mountain hut, rather a private hut, but somehow the name has stuck! 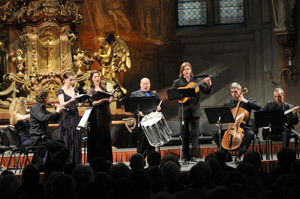 The Dom pri izviru Završnice hut. 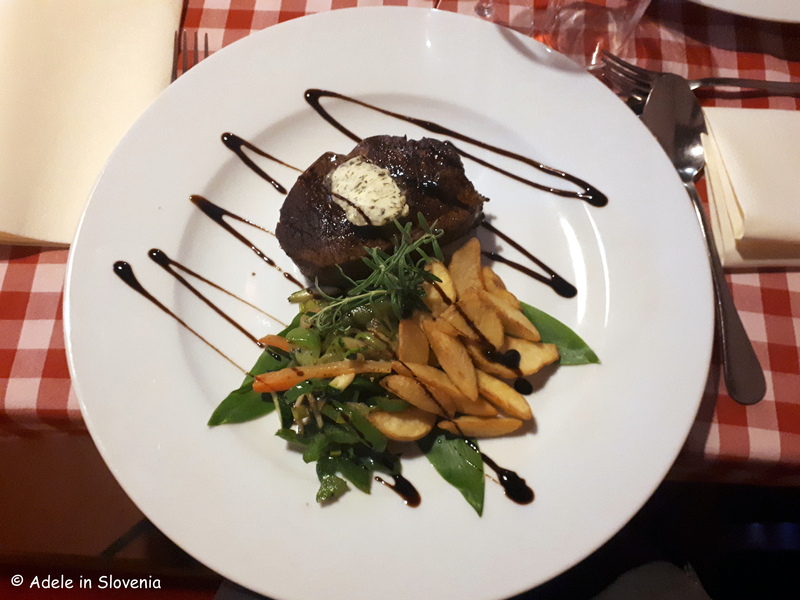 which was recently renovated and has new beds and furniture, is situated at an altitude of 1425m above the Smokuč mountain pasture (Smokuška planina) and on the backside of the Zelenica ski piste (sadly, no longer operational). The hut is open from 1st June to 1st October, and at other times at weekends, weather permitting, and by prior arrangement for groups. 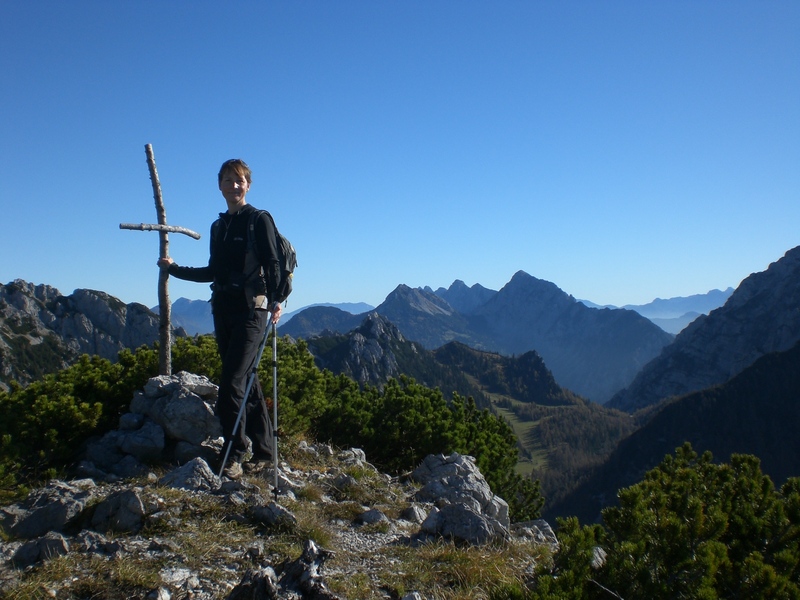 From the hut there are numerous options for continuing to explore the peaks of the Karavanke including Vrtača, Begunščica and Stol. I always find the springs of rivers and streams fascinating. Where on earth does all the water come from? 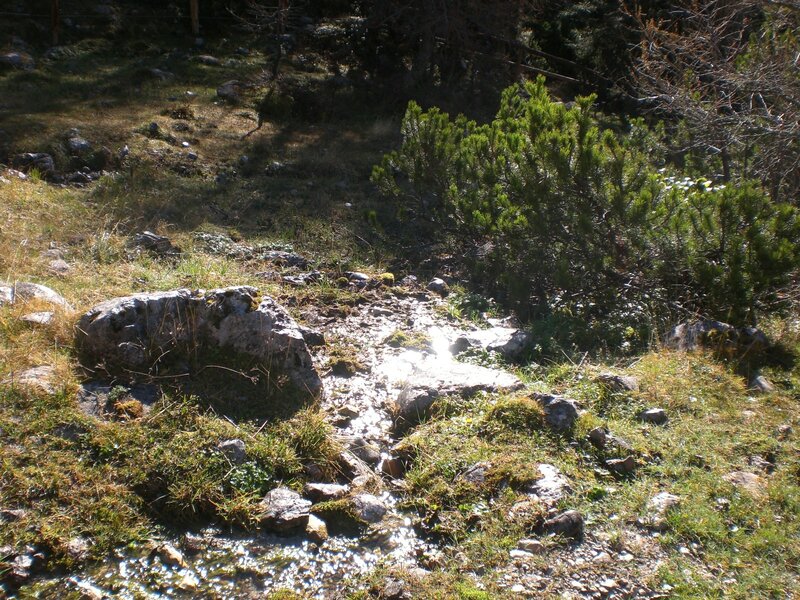 At the source of the Završnica stream, there is barely a trickle of water to be seen – and that despite the abundance of snow and rain this year – yet just a little further down the valley, it turns into a gushing stream. 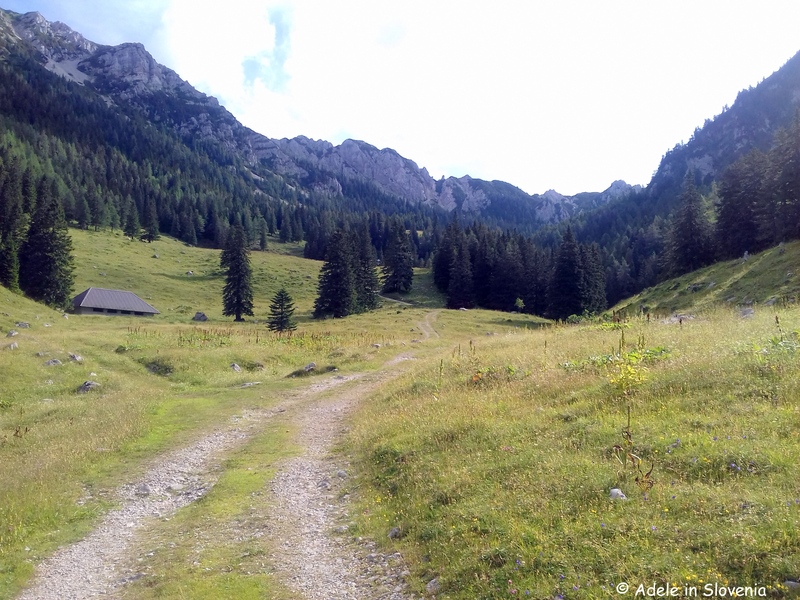 The beauty of hiking in the Karavanke, particularly in the ‘summer’ (ahem! ), is the lack of crowds. I hiked for close to 5 hours and only met around a dozen people in that time – bliss for those who really want to get away from it all. 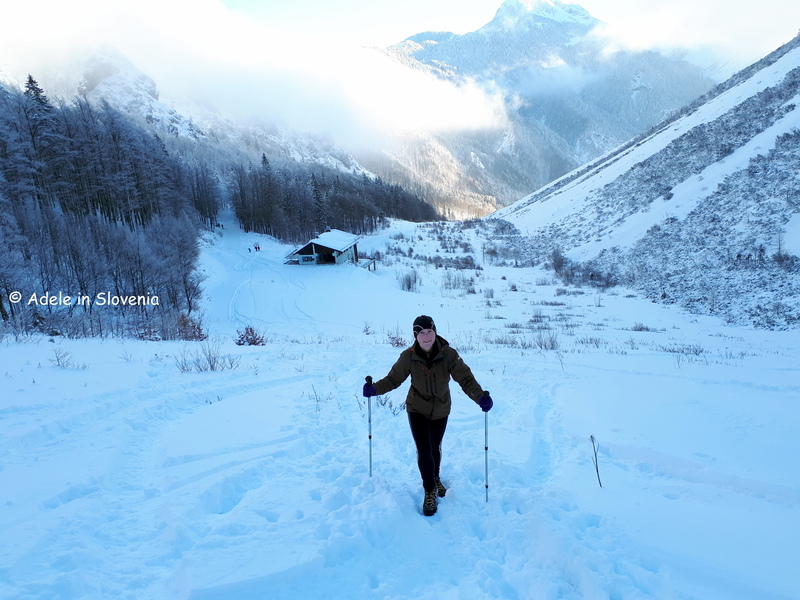 As I like to make my hikes circular, where possible, I continued from the hut up the ski slope before turning left and heading on the slopes beneath Vrtača. In this area there is a lot of loose rock and scree, so you need to keep your wits about you. As you get higher, you are rewarded with a glimpse of Lake Bled in the distance. 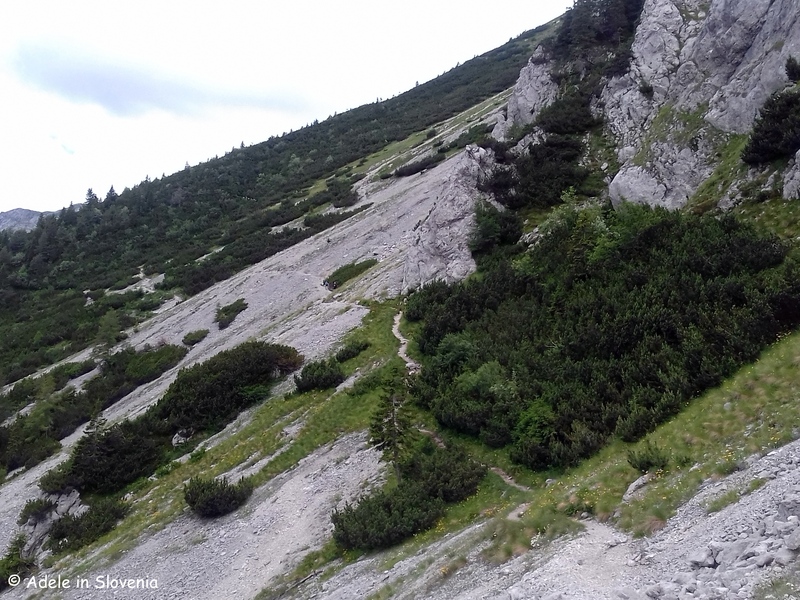 Where the path branches off right to ascend the summit of Vrtača, I took the left fork marked for Stol. 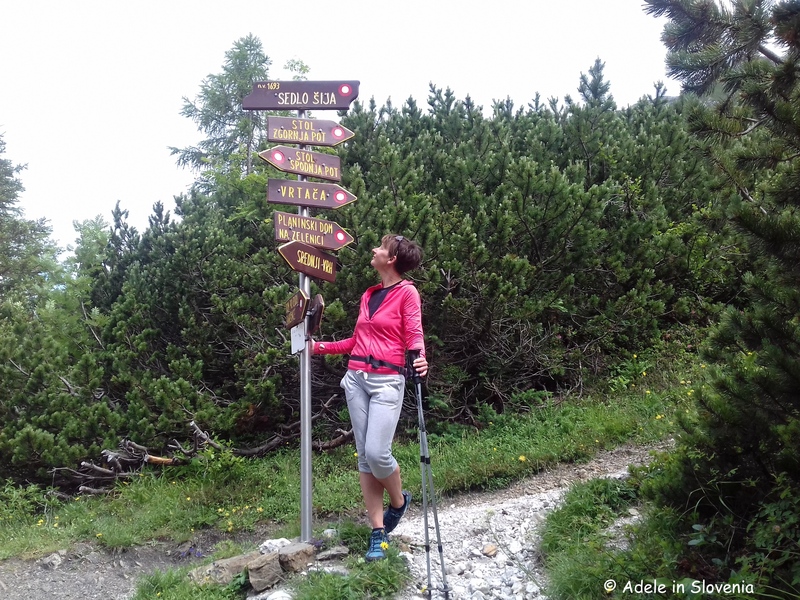 On reaching a junction I then descend to the Šija saddle, from where there is certainly no lack of choice of where to go next! 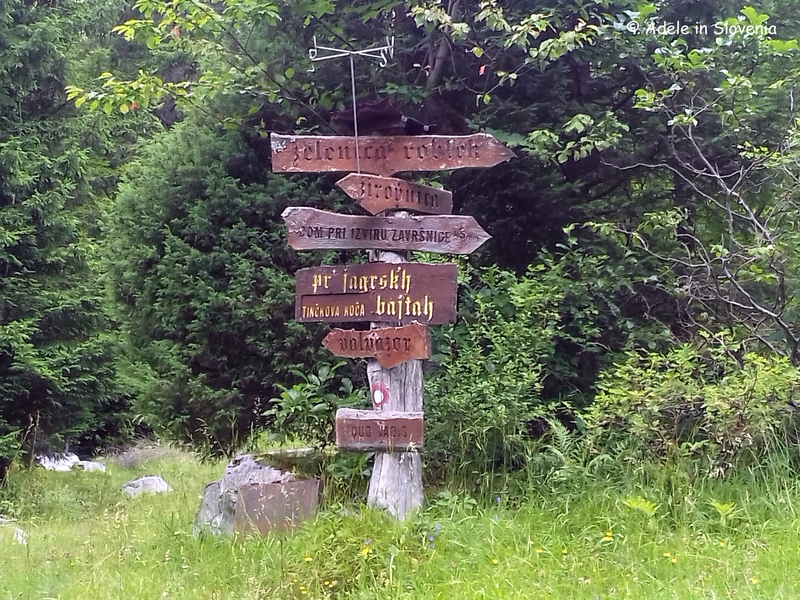 I chose the path to Srednji vrh (1796m), which is just a further 15 minute climb from the saddle. At the top there is a visitors’ book, a solitary bench and fab views! 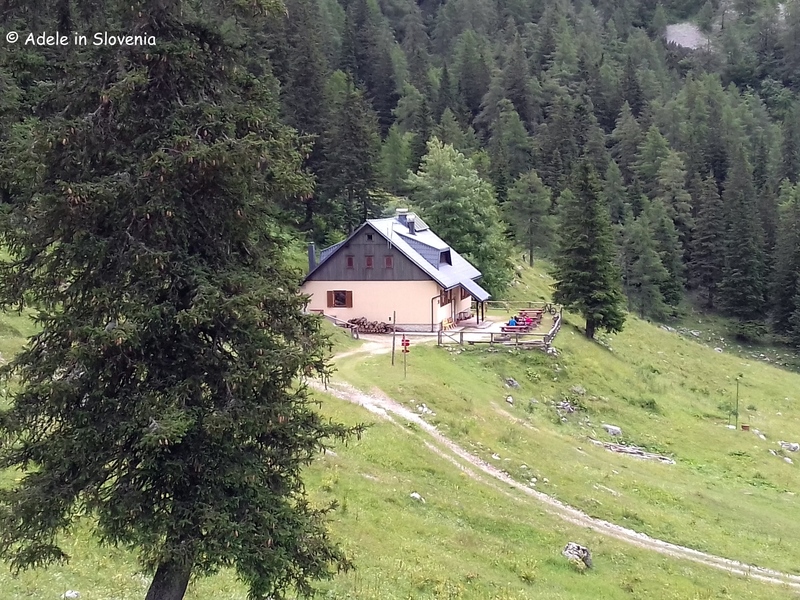 I then descended back down towards the hut, which is less than half-an-hour from the Šija saddle before returning on the same road. 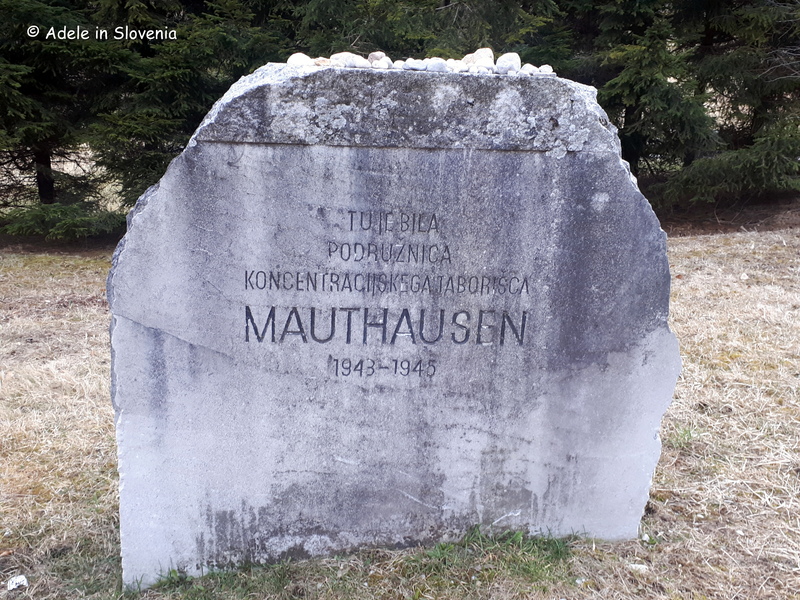 Click here for more information and this and other hikes in the Žirovnica area. 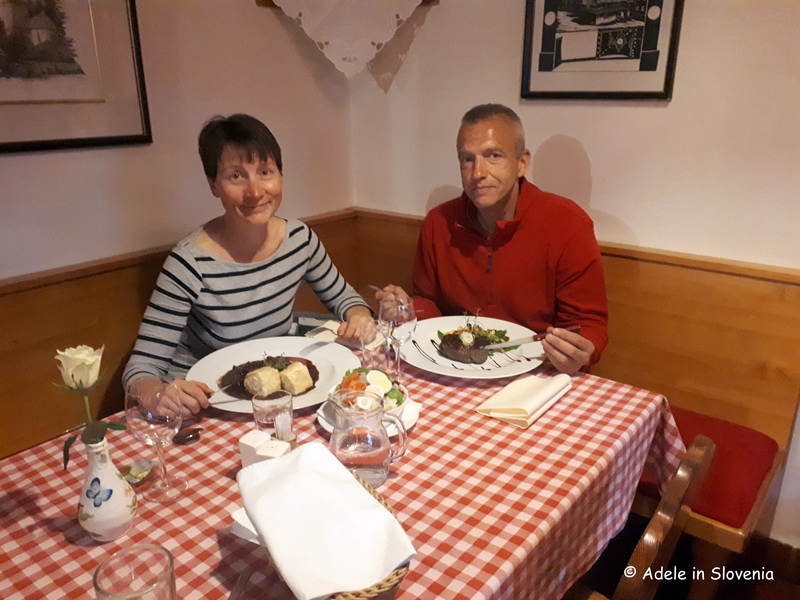 As much as I love hiking and cycling in the hilly and mountainous surroundings of Radovljica, there are the occasional times – such as when I’ve already hiked for 5 hours and am tired but don’t want to be at home when the weather is so beautiful – when a nice leisurely bike ride is called for. Fortunately, we have that here too! 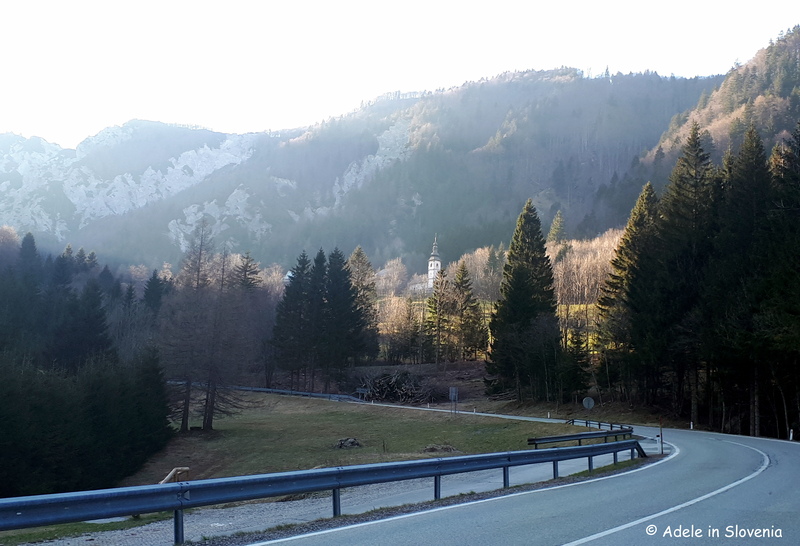 So, on Friday, after the aforementioned 5 hour hike (more about that another time), I cycled to the Završnica Recreation Park in the Završnica Valley which, from home, takes less than 45 minutes, taking the route Radovljica – Lesce – Hraše – Rodine – Zabreznica – Žirovnica – Moste – Završnica, and then to the Zavrh bar which has lately become one of my favourites places to sit and enjoy a drink beside the cool of the Završnica stream. 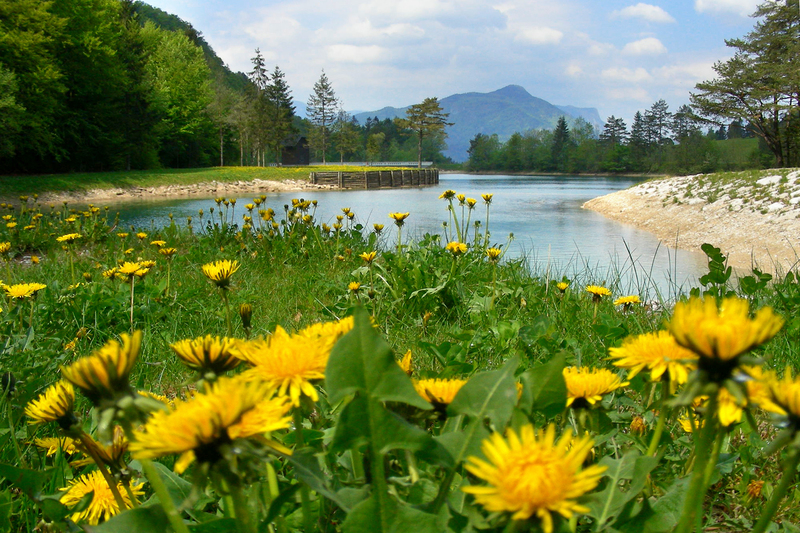 The reservoir is also the start point of the 2km-long Završnica Trim Trail which leads beside the stream to the Zavrh bar and onwards, making it perfect for these sultry hot days when the cool of the forest offers some respite from the heat. The Recreation Park also comprises a football field, a natural climbing wall and beach volleyball courts. 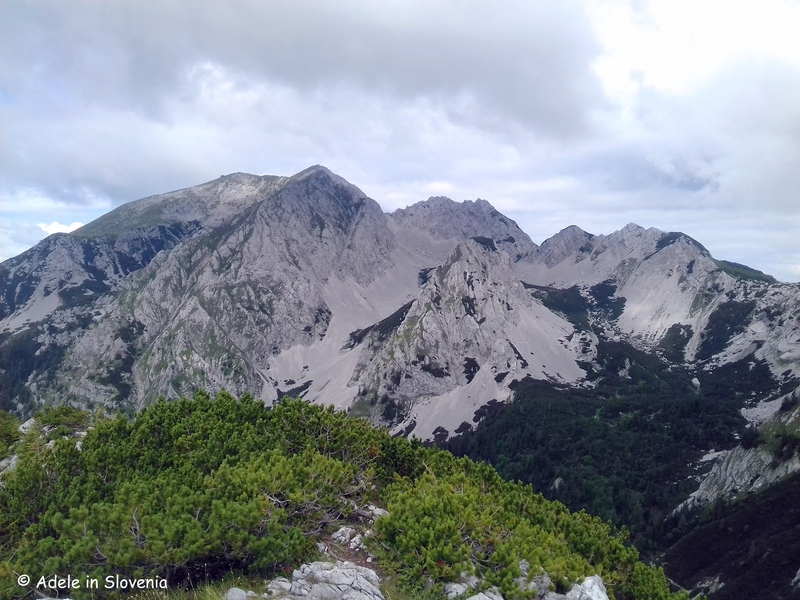 The Završnica Valley is also an excellent starting point for mountain biking, and for hikes in the Karavanke mountains, such as to Stol, the highest mountain in the Karavanke, or to the ski slopes and the spring of the Završnica stream at Zelenica. Fishing and horse-riding are also popular activities in the valley. But it’s not time to be thinking about winter yet. Still more good weather ahead this week to enjoy…. 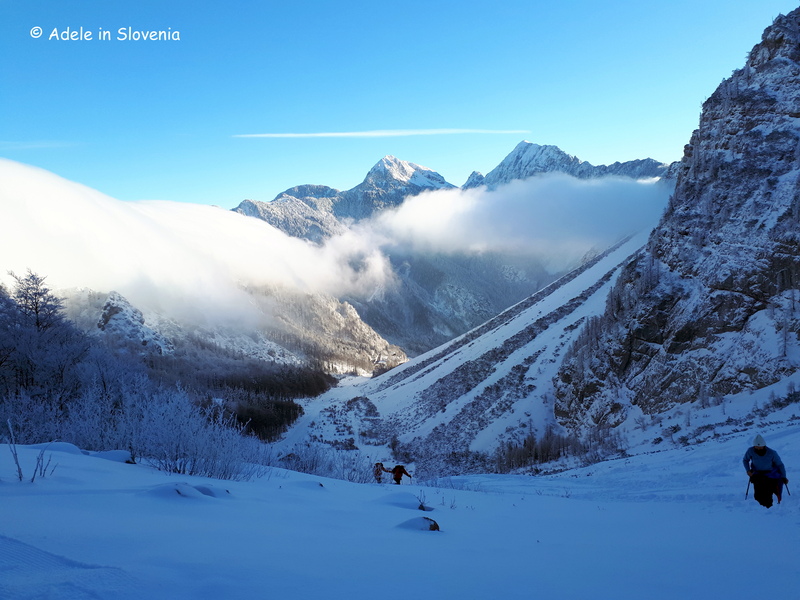 Slovenia’s Karavanke mountains are, without a doubt, at their most beautiful during the autumn months, and this year is no exception, especially when the autumn weather is as glorious as it has been these past couple of weeks. It doesn’t exactly make-up for the dreadful “summer” we encountered this year, and is all set to end tomorrow with temperatures forecast to plummet, but it has at least provided a welcome respite from battling the elements. So on Sunday morning, after a particularly busy week spent largely working at the computer, I decided it was time for a bit of ‘me time’! However, seeing as I knew I still had a mountain of work awaiting me at home, I needed to go somewhere not too far from home, yet far enough to make me feel I’d had a few hours away from the usual environment. This is one of the pitfalls of being self-employed and working from home. Of course it has its upsides too but, as with all jobs, there are the inevitable downsides and for me isolation and constantly being in one room are the predominant ones. Anyway, fortunately I’m surrounded by the most stunning scenery so when moments of calm and respite are needed from time-to-time, they are never far away. 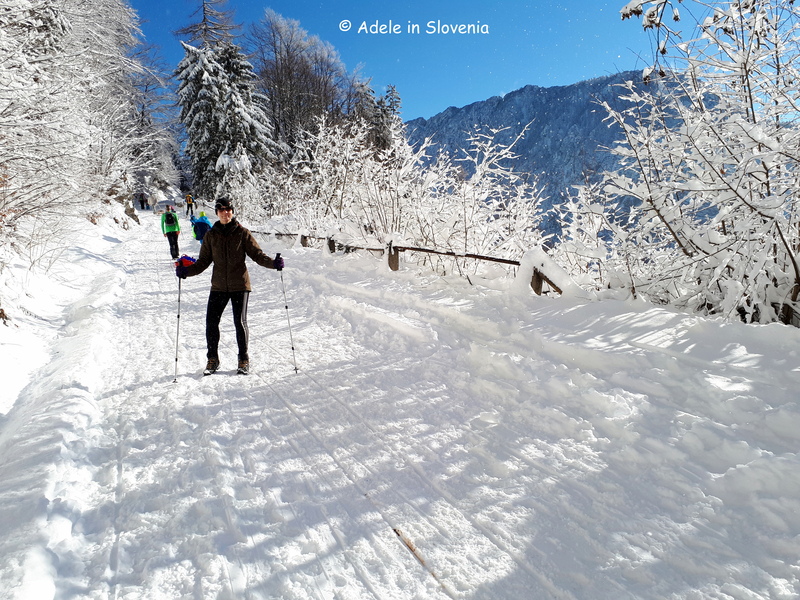 Totting up all the options and taking into account the limited time, the position of the early-morning sun, and where I hadn’t been for a long while, I decided to head to Ljubelj for a walk up the Zelenica ski piste and onward to the peak of Srednji vrh. 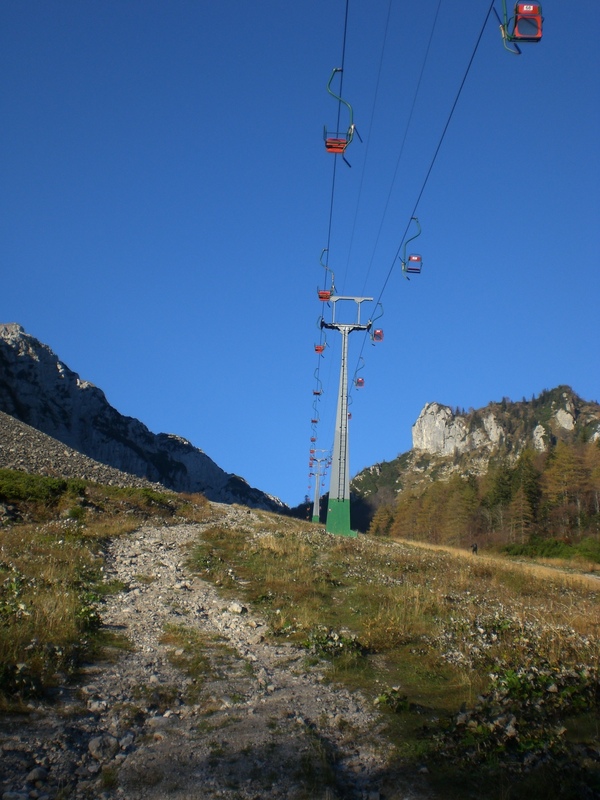 The Zelenica ski slopes are set between the mighty north-walls of Begunščica and Vrtača to the south (at 2060m and 2181m respectively, the 7th and 5th highest of the Karavanke range). 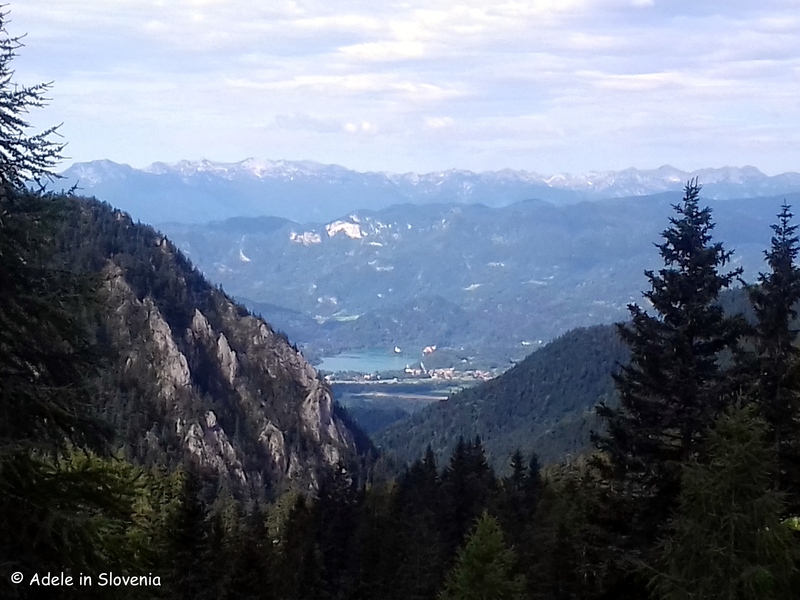 There are stunning views across the Podljubelj valley to the east and the Završnica valley to the west. 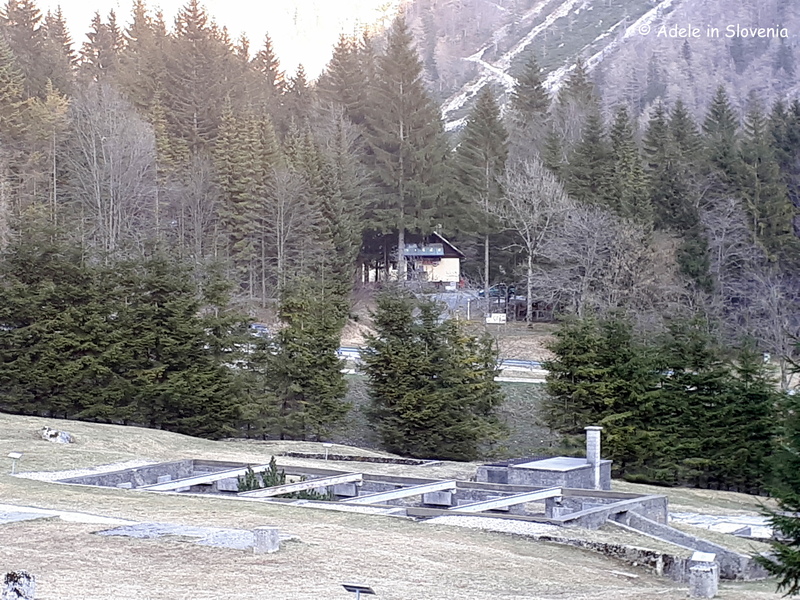 Due to unfavourable snow conditions, and the consequent financial implications, unfortunately the ski resort has not been in regular operation for the past couple of years. 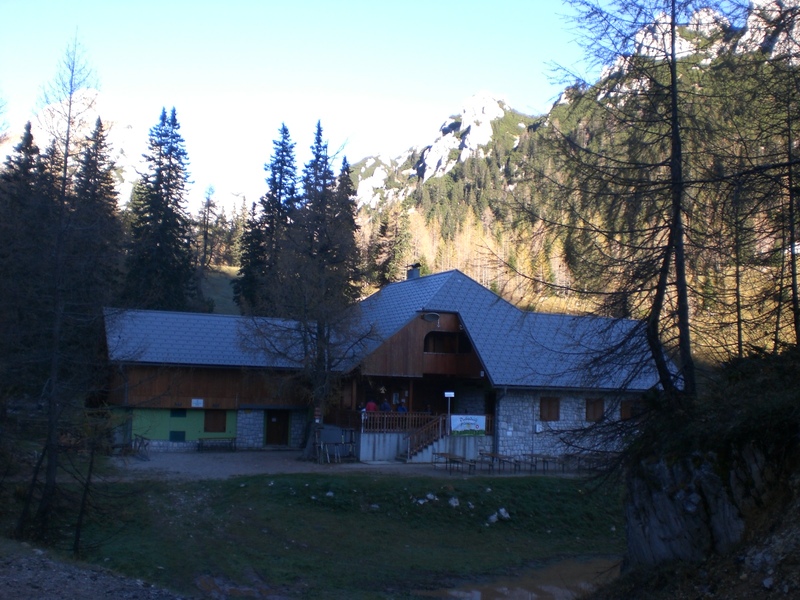 However, the mountain hut Dom na Zelenici was renovated a few years back and regardless of the season, or whether the ski piste is operating, this is still a very popular area year-round with hikers and also ski tourers who simply put their skis on their backs and walk up to one of the surrounding peaks before skiing back down. 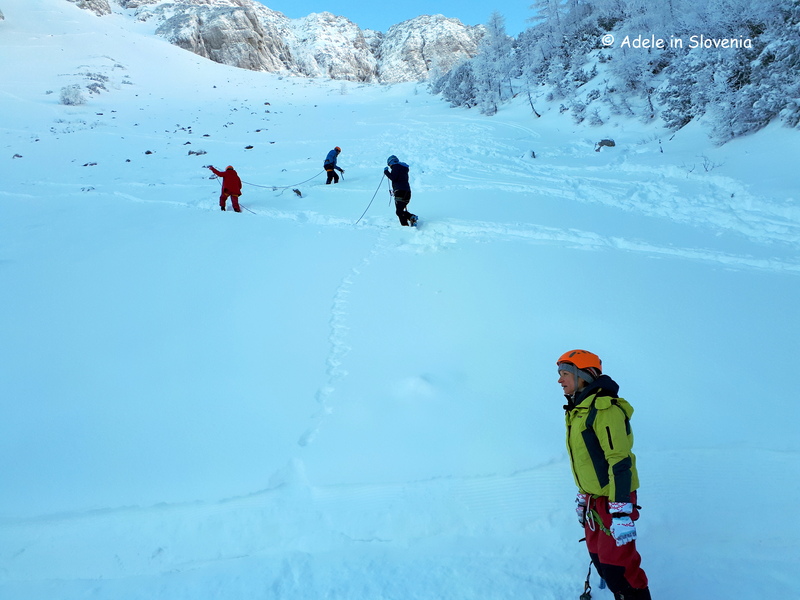 Ski touring is popular in Slovenia and it also means, as in this case, that the lack of operational chairlifts needn’t present a problem. Ljubelj is one of the border crossings (though nowadays obsolete) from Slovenia into Austria. There is still a duty-free shop, a restaurant and a large parking area, just as well, as by the time I returned to my car, the car park and all the surrounding parking areas were absolutely rammed – I don’t think I’ve ever seen it so busy, again a reflection of people’s desire to make the most of the little sunshine that we have been afforded this year. 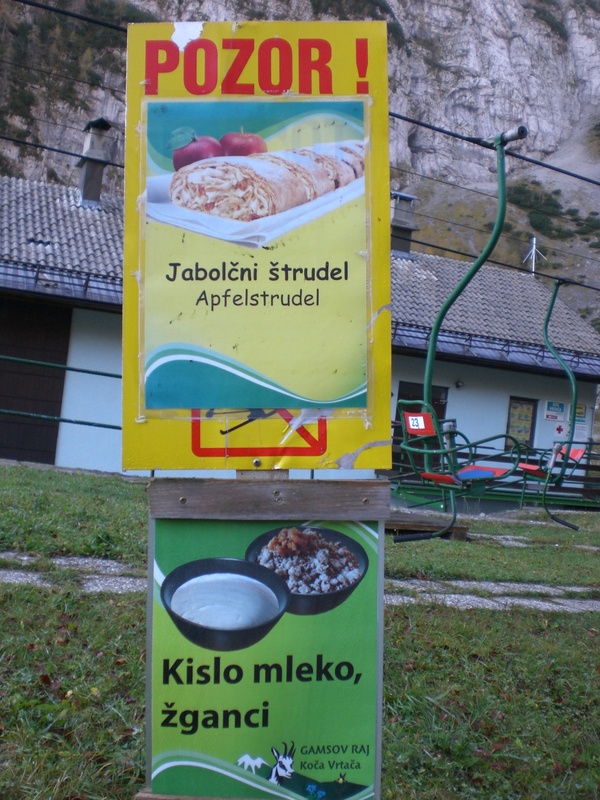 My morning began with the steep slog up the ski piste, passing the Vrtača koca hut, where interestingly the sign, as seen below, tells us to ‘BEWARE OF APPLE STRUDEL’! Note the cloudless blue sky – not many of my photos have looked like that this year – hence I ended up taking a lot of photos, too many to be shown here, so I will post the rest on my Pinterest page. Continuing onwards the Zelenica mountain hut (Dom na Zelenici, 1536m) is reached in less than an hour from the carpark, and for some people this popular hut is a destination in itself. 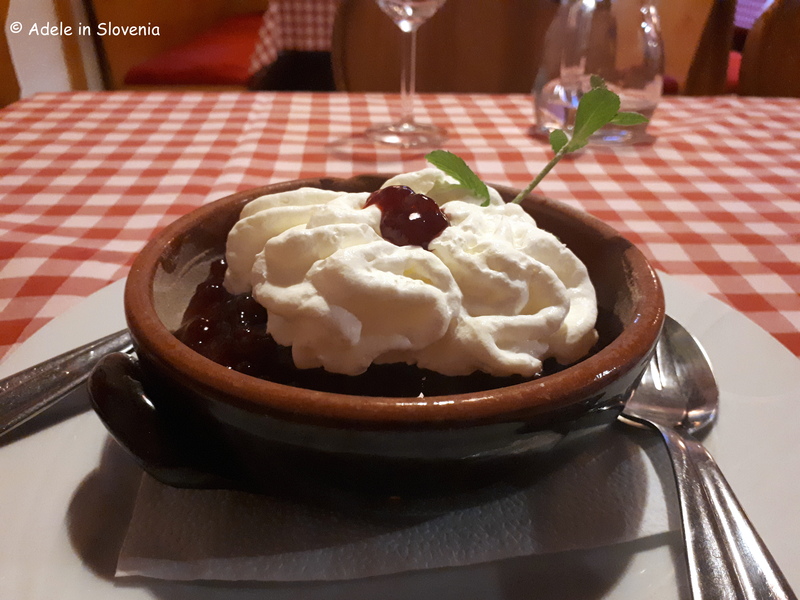 However, there are still many beauties awaiting ahead so I continued, first in the direction of Vrtača, crossing its steep scree-covered lower slopes, before branching off on the route signed towards Stol, and again branching off to the Šija saddle. It was great to see that since I was last here, quite some considerable effort has been made to update and renew the signage and, as can be seen below, there’s no shortage of choice! 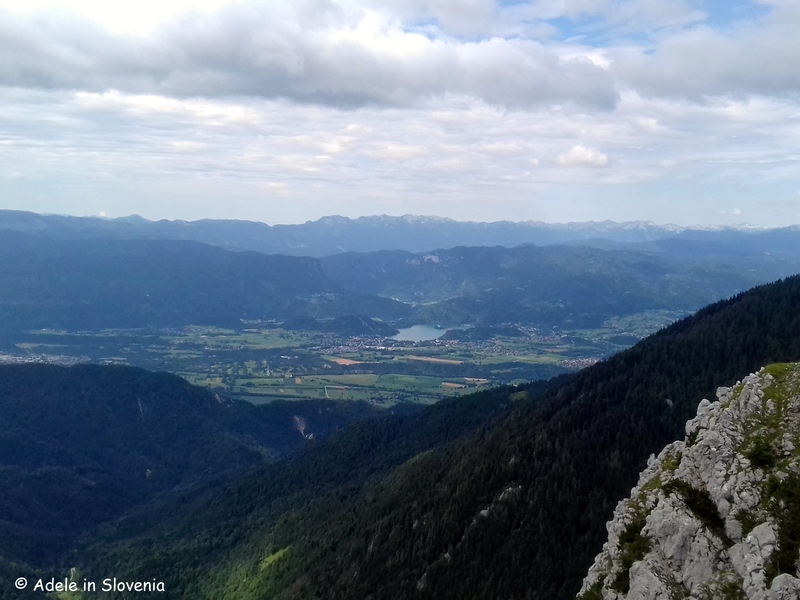 From the Šija saddle, I took the path up to the peak of Srednji vrh (1796m) for a quick photo stop and the amazing far-reaching views across the valley towards Bled lake and the Julian Alps. 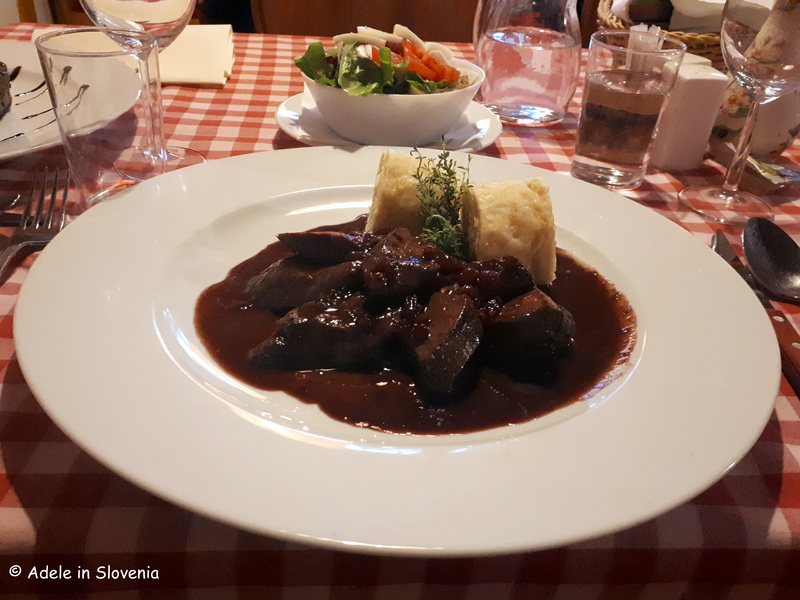 On returning to the saddle I then took the path down to the picturesque mountain hut ‘Dom pri izviru Završnice’– so named as it sits very close to the spring for the Završnica stream. Don’t expect to see rushing waters though, in fact if you didn’t know it was there, blink and you’d miss it! The week ahead looks like being another busy one, not least because I have been asked to be a plenary speaker at an international tourism and hospitality conference taking place this Friday. My presentation is entitled ‘Blogging for Tourism’ – Wish me luck!